Rust surveys undertaken in Azerbaijan by Konul Aslanova and colleagues from the Azerbaijan Agricultural Research Institute of Crop Husbandry in May/June 2015. Of the 11 widely dispersed sites surveyed, stem rust was observed at 6 sites (55%). High or moderate severity of stem rust was observed at all these sites, with both bread and durum wheat infected. Stem rust incidence and severity was highest in the Jalilabad area in the south-east Caspian Sea region of Azerbaijan, close to the Iranian border. Samples are currently undergoing race analysis and the current race(s) are unknown. In previous years the Digalu race (TKTTF) has been reported from Azerbaijan. 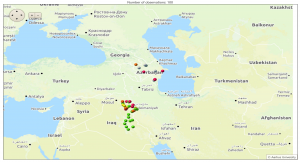 Rust surveys undertaken by Dr Emad Al-Maaroof and colleagues from Suleimaniyah University, Iraq in April/May 2016 covered 89 fields in Central and North-east Iraq. In the North-East – the Suleimanyah, Kirkuk, Erbil region – stem rust was detected in 40 fields, with high or moderate severity at most sites. The durum variety Adana-99 was most severely affected. Samples are currently undergoing race analysis and the current race(s) are unknown. In previous years the Digalu race (TKTTF) has been reported from Iraq. These surveys combined indicate the potential increasing presence of stem rust in the region.